Thanks for the fast evolvement of wireless tech, we are now experiencing higher speed wireless network than before. People always want wireless because we naturally don’t like mass wires. Wireless is currently an inevitable trend and lifestyle for everything. Wireless HDMI transmission entered the world as a vivid explanation of this phenomena: WE WANT ALL THINGS WIRELESS!! Now Wireless HDMI transmission is available and affordable. It can be performed through several different protocols including WHDI(Wireless Home Digital Interface), WirelessHD, WiGig(Wireless Gigabit Alliance),WiDi(Wireless Display), Airplay, Miracast and others. These wireless protocols share something in common but also have their own distinct characteristics. Some of them have already won big percentage of wireless HDMI consumer market, while some others are still theoretically practical but without actual products. So there are diverse kinds of wireless HDMI extended kits with diverse protocols. It is not so easy to tell the difference between them. We will make some simple description of each wireless HD transmission standard to help you form a clear image when getting yourself a wireless HDMI kit. 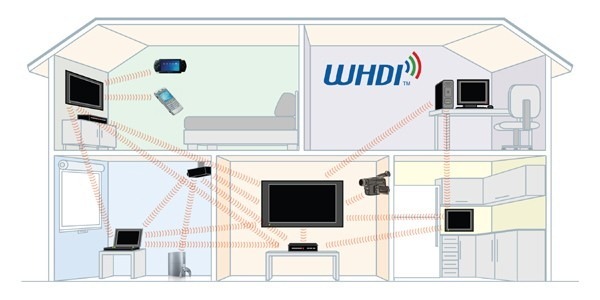 As the first practical and successful wireless HD transmission protocol, WHDI can deliver wireless interactive HD video from any device to any displayer. WHDI has changed our previous impression of wireless video: lose of quality, long latency, distortion of image. It provides us uncompressed HD signal up to 1080p resolution in the 5Ghz unlicensed band, with support for 3D TV and 5.1 surrounding sound as well. What WHDI gives customers is the convenience and the flexibility. 5GHz spectrum regulations are naturally superior for wireless transmission. The range under this WHDI wireless protocol is beyond 100 feet. Signal can easily penetrate brick walls. You can easily setup a whole wireless entertainment system without any worrying about the location of devices, whether it is for the source or the playback . Any Wireless HDMI device with this protocol comes with near zero and neglectable latency, namely less than 1ms. WHDI also features feedback controls channel, so you can control the source device through its own remote or gaming paddle. These make it a perfect partner for a gaming console and any circumstance requiring harmony of separate screens. You can easily connect any video sources through a WHDI Wireless HDMI transmitting kit with HD displayers wirelessly. These devices include: PC, Notebooks, Smart Phones, Satellite boxes, Xbox and Blu-ray players. In short terms, WHDI equals uncompressed 1080p+ low latency+ multi-room availability + low power consumption. It surpasses competitive technologies by providing outstanding and consistent picture quality equivalent to wired HDMI cable. The WirelessHD specification is based on a 7 GHz channel in the 60 GHz Extremely High Frequency radio band. Unlike other wireless HD signal broadcast protocol WirelessHD choose a high frequency radio realm 60 GHZ to fulfill its mission. All characteristics of this specific wireless communication consortium are determined by this unusual decision. This fundamental difference of 60 GHz systems has some technical advantages compared to other network protocols like Wi-Fi, but also has some inherent limitations. WirelessHD protocol utilizes this very high frequency to increase the amount of network bandwidth and effective data rates they can support. It can provide uncompressed digital transmission of HD video and audio and data signals, essentially making it equivalent of a wireless HDMI. The 1.0 version of this standard supported data rates of 4 Gbps, while new version 1.1 increases the maximum data rate up to 28 Gbit/s. This is the highest theoretical data rate of all wireless HD transmission nowadays. So WirelessHD supports 1080p, 3D formats and 4K resolution without any problem. Another superior point of WirelessHD is the compatibility of high rates wireless audio formats The DVDO Air Based WirelessHD protocol is the only available wireless HDMI product can transmit 1080p video and 7.1-channel audio simultaneously, While WHDI product like Nyrius Pro are now capable of 5.1 channel, without using an HDMI cable. Like WHDI it also features remote controlling which enables users to control the WirelessHD devices and choose between sources for the display. The WirelessHD specification supports DTCP(Digital Transmission Content Protection) for encrypted content with copyright. High frequencies equal short waves. These waves are might likely to reflect on any smooth surfaces. Signals under this protocol are not able to pass through most physical obstructions. Although WirelessHD try to enlarge the beaming range by increasing the signal’s effective radiated power and utilizing wall reflections. This typical 60 Gbps HDMI wireless protocol vivid connection is still within the distances of 30 feet. WiGig is the trademark for Wireless Gigabit Alliance, an alliance formed to develop and promote the wireless Wi-Fi transmission protocol 802.11ad. Like WirelessHD, this protocol is operating over the unlicensed 60 GHZ frequency band. The WiGig specification allows devices to communicate without wires at multi-gigabit speeds. Theoretically a typical WiGig device can deliver data transfer rates up to 7 Gbit/s with whole 7 GHZ bandwidth.It is approximately as fast as an 8 antenna 802.11ac transmissions. If divided to four 2.16-GHz wide channels, one single-channel can archive a speed up to 4.6 Gbit/s. WiGig Alliance has merged with the Wi-Fi Alliance and its wireless HDMI standard is defined in the IEEE 802.11ad. This means WiGig get a full compatibility with existing Wi-Fi IEEE protocols. Most consumers are well aware of IEEE protocols because they have experience with all the earlier ones, namely IEEE 802.11a, b, g, and n. The 11b/g/n standards operate in the 2.4-GHz band. The 11a/ac/n standards operate in the 5-GHz band, and the 802.11ad standard targets the 60-GHz band. The WiGig tri-band Wi-Fi chips can switch seamlessly from one standard to another in one of the three Wi-Fi bands: 2.4, 5, or 60 GHz. Maybe WirelessHD has a step in advance for giving of tangible products. But WiGig will not lose this battle lightly. The 60 GHz signal cannot typically penetrate walls connections through walls. WiGig high rates wireless HDMI connections are also restricted to a single room. Nonetheless, unlike WirelessHD when roaming away from the main room WiGig can switch to make use of the other lower bands,2.4 or 5 GHZ, at a much lower rate, but which propagate through walls. WiGig and WirelessHD are widely perceived as competing technologies. Some believe WiGig may even replace Wi-Fi technology someday, although this would require solving its range limitation issues. There are no practical WiGig product except Dell has made some trying. Miracast is a Wi-Fi direct peer-to-peer connection without interaction of wireless router. In this respect, it functions like a Bluetooth connection. Miracast supports 1080p HD video and 5.1 surround sound as well. It allows users to mirror the display from a phone or tablet onto a TV, share a laptop screen with the conference room projector simultaneously.The most common used product are Google Chromecast. Intel has developed its own wireless transmission protocol: Wireless Display(WiDi). Like all the standards referred to above, WiDi also supports HD 1080p resolution and 5.1 channeled audio. Low latency and interacting app are featured with this wireless transmission technology. It is more for source devices like tablets and smart phones. Laptops/ Ultrabooks with WiDi 3.5 and higher are Miracast-compatible. There are plenty of Wireless Display Dongles and Laptops supporting WiDi transmission. AirPlay is the most famous licensed proprietary protocol by Apple. Originally it is just for Apple’s own software and devices to stream audio, video, and photos. In order to be competitive with others, Apple has licensed AirPlay to third-party company. Many products are now compatible for AirPlay,but the most successful AirPlay device is no doubt the Apple TV by Apple inc. itself. We often need reliable wireless video connection to pass through walls or rooms in some places where drilling holes or wire relocation is inconvenient or even impossible. So wireless is perfect for a rented home, houses owned by cautious owners or designers who want to relocate their display device. Wireless HDMID broadcasting reduces installation time and removes the need for complex cable arrangement. These bring us a more flexible solution to deliver the best wireless HDMI image. Wireless has been prevented to be time and money saving. WHDI is the most successful and practical protocol for wireless HDMI presently. Although there are various wireless HDMI protocols WHDI technology is the only technology that promises the delivery of 4K resolution by next year. Using the 5Ghz unlicensed band, it surpasses competitive technologies by providing outstanding and consistent picture quality equivalent to wired high quality HDMI™ Cable, low latency (less than 1ms), multi-room availability and low power consumption. 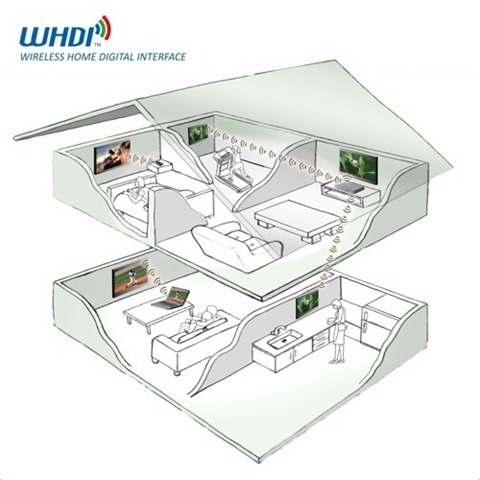 WHDI turns out to be more reliable and flexible than 60Ghz technologies such as WiGig and WirelessHD because of their inability to pass through barriers and walls. WiDi, AirPlay and Miracast need supporting from certain products or software to perform wireless HD transmission. In the above table, you can see other tech details of these wireless HD transmission consortium. 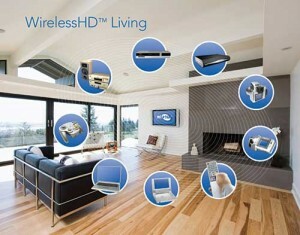 Peerless HDS200 HD Flow Pro Wireless Kit and Atlona LinkCast Wireless HD Audio/Video Station. They support extra receivers. In my experience, WirelessHD is the only worth attention. Yes, it’s rather expensive, but it worth it. WirelessHD showed good results: good picture quality and no lattency in practical experience (1- within 1 big room, 2-there was a wall on the way of signal). Thank you for your commenting to share with your own experience. WirelessHD and WHDI are the main competitors in this field. I wish to point out that although “There are plenty of Wireless Display Dongles and Laptops supporting WiDi transmission”, If you don’t have a laptop already rigged for WIDI/Miracast, it’s dang difficult to remedy. I can’t find any USB wifi dongles currently on offer from Amazon, Newegg, Tigerdirect, B&H Photo & Video or even on ASUS own web site that admit to supporting WIDI/Miracast. In fact there are many. For sources all Laptops and tablets with Intel’s fourth- and fifth-generation Core processors and Intel’s own 7260 wireless chip support Miracast. For playback devices manufacturers like Sony, LG, Samsung, Toshiba, Panasonic have already added Miracast to their high-end televisions. If you wish to get a Miracast receiver or adapter. Miracast receivers and adapters and other similar products are running to customers the same time I am typing.